Tracey Eccleston, IAYT, E-RYT 500, IPT, is owner & educational director of Ageless Arts Yoga offering a 200 hour Yoga Teacher Training and many workshops. She is the creator two Chair Yoga Teacher Trainings - "The Foundations of Chair Yoga” &" Chair Yoga Therapeutics; Balance & Support." After completing her 200 & 500-hour yoga teacher training, Tracey saw the need to make yoga even more accessible. She studied and was co-director of Lakshmi Voelker Chair YogaTM. She has also Trained and assisted Lee Albert in Integrative Positional Therapy at Kripalu. She teaches around Canada & the United States at venues such as Kripalu, The New York Open Centre ant the Toronto Yoga Conference and Show. Tracey believes in the importance of working within each individual’s natural range of motion exploring somatic movement. Tracey has extensive experience working with seniors and people who use wheelchairs. She works alongside doctors, physiotherapists and occupational therapists and many others in the medical field. It is her passion to make yoga accessible to everybody and every body. Explore the many techniques you can use to make asana more accessible by learning the importance of language and understanding how physical proportions, compression, tension, and orientation affects our body. Learn how to adapt, teach, and support bodies that don’t naturally "fit" into many yoga poses. This workshop offers awareness of and solutions to the challenges faced when working with a mature population with a variety of special needs, including but not limited to arthritis, Alzheimer’s, MS, osteoporosis, and limited mobility and movement. 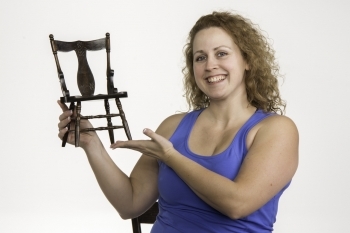 Includes adapted poses both on the chair and using the chair as a prop. Suffering from headaches, or neck, low-back, or knee pain? Learn to re-align and relieve pain caused by structural imbalances. Integrative Positional Therapy (IPT) Yoga offers practical, proven, easy-to-follow yoga techniques to reduce and even eliminate muscular pain. Leave with the tools to build your own personal IPT Yoga Class.